Whitney Port's story line in The Hills has finally made a come back, just in time for it to end. Whitney and Lauren Conrad take a trip to New York to meet up with their boss Kelly Cutrone at Peoples Revolutions New York office. Whitney runs into Alex, the model Kelly set her up with last time she was in New York. Alex is going to be a model in the show Whitney and Lauren are working on. Just when you think someone's love life is going to run smoothly..it doesn't. After the show Whitney and Lauren go to a resturant owned by Adam, one of the models in the show, at the resturant Whitney and Lauren get to meet Adam's roomate Jay, who just so happens to be the singer of the band playing that night, and right away everyone notices Whitney crushing on him. Too bad for Alex, but he makes it known how he feels..to everyone but Whitney that is. Just enough drama to start off Whitney's new show The City, should be interesting. Whitney's drama should also give H eidi Montag a run for her money. 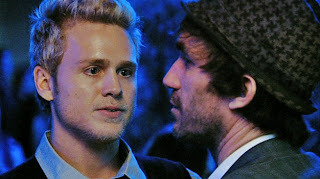 Heidi once again finds herself in a bad situation that Spencer Pratt has gotten her into. Instead of leaving things alone, Spencer goes to talk to Heidi's ex-boss Brent Bolthouse thinking he can change his mind about firing Heidi. Yeah Right! Brent hates you just like everyone else, DUH! Leaving Heidi no choice but to talk to Brent herself. Favorite line in this show: "Don't you know you are the company that you keep?" Couldn't have said it better myself Brent, but it will take more than that to convince Heidi that Spencer is no good for her. Guess we'll see how it play's out next week and if Heidi gets her job back. "Your boyfriend is a nightmare." Love it Brent.